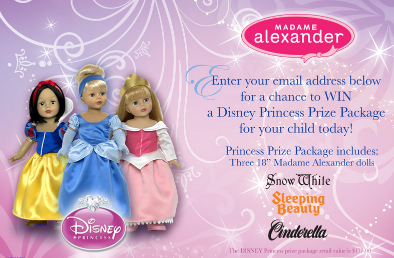 Madame Alexander Disney Princess Sweepstakes – Win Disney Princess dolls! Win 3 Disney Princess Dolls! 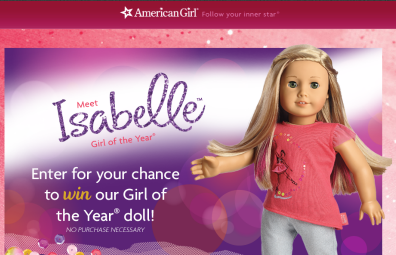 ENTER SWEEPSTAKES HERE – Madame Alexander Dolls Facebook page. ELIGIBILITY – Open only to legal residents of the 50 United States or District of Columbia, 18 years or older as of date of entry. SWEEPSTAKES PERIOD – Sweepstakes ends November 17 at 12:00 PM/PST. PRIZES – Winner will receive 3 Disney Princess Dolls – Snow White, Cinderella and Sleeping Beauty.